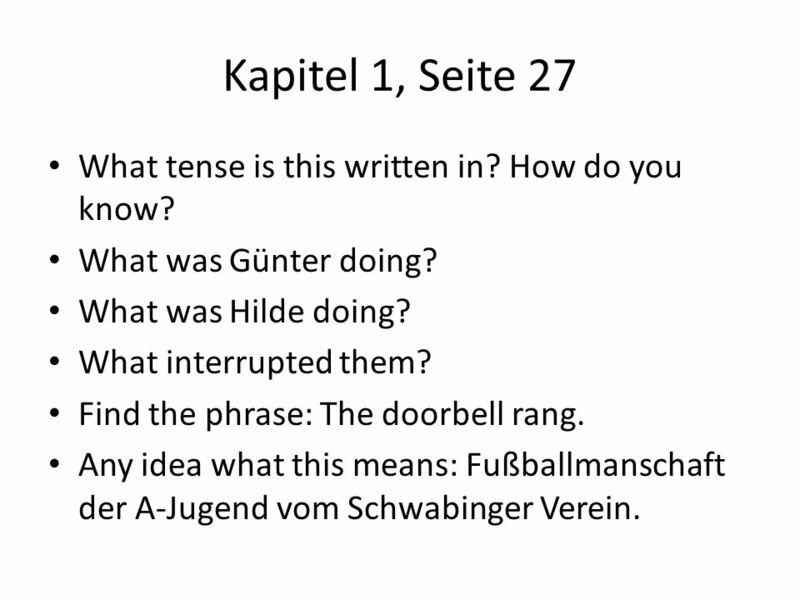 2 Kapitel 1, Seite 27 What tense is this written in? How do you know? What was Günter doing? What was Hilde doing? What interrupted them? Find the phrase: The doorbell rang. 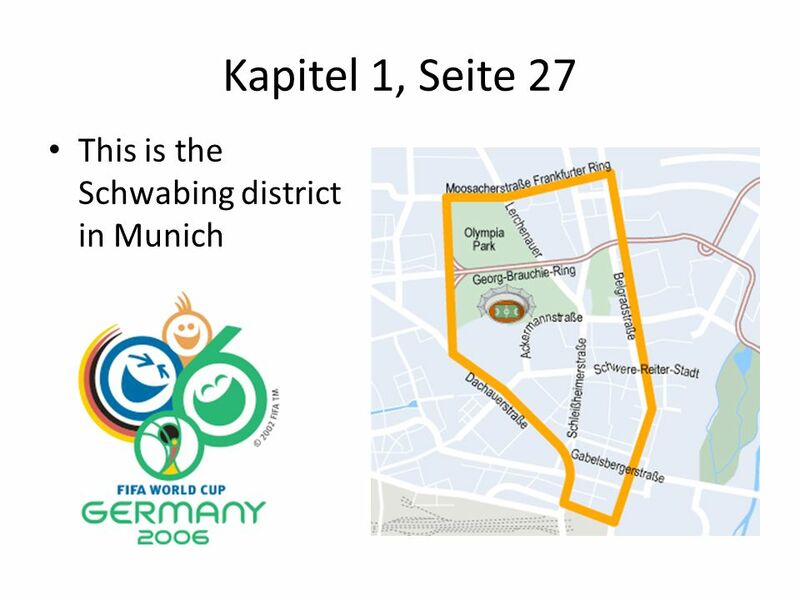 Any idea what this means: Fußballmanschaft der A-Jugend vom Schwabinger Verein. 4 Kapitel 1, Seite 27-29 Find the phrase that says: They all talked at the same time. What does “Immer mit der Ruhe” mean? What would be a teen expression for this? Wer ist Heinrich? Wie sieht er aus? 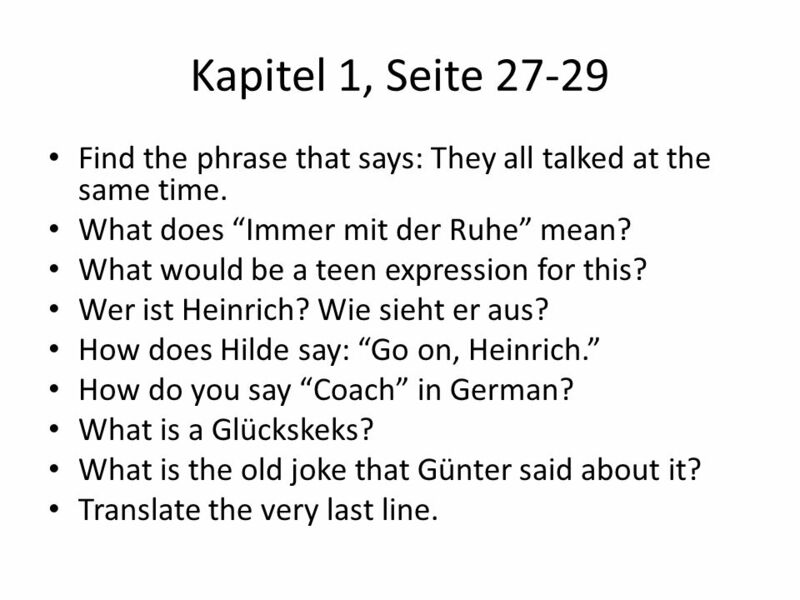 How does Hilde say: “Go on, Heinrich.” How do you say “Coach” in German? 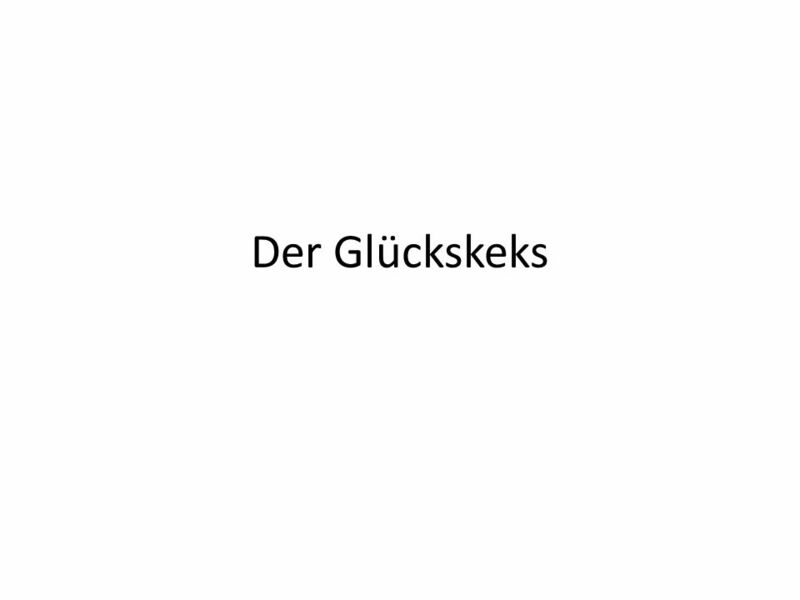 What is a Glückskeks? What is the old joke that Günter said about it? Translate the very last line. 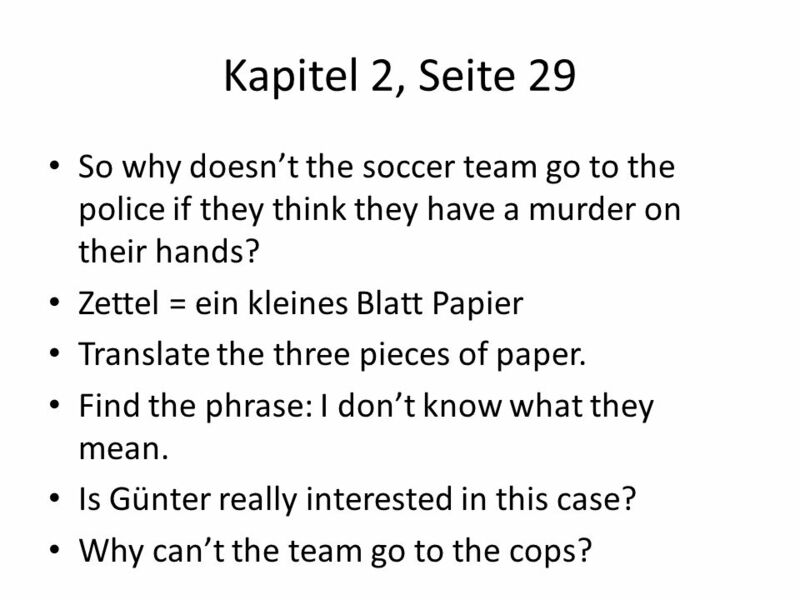 6 Kapitel 2, Seite 29 So why doesn’t the soccer team go to the police if they think they have a murder on their hands? Zettel = ein kleines Blatt Papier Translate the three pieces of paper. Find the phrase: I don’t know what they mean. Is Günter really interested in this case? Why can’t the team go to the cops? 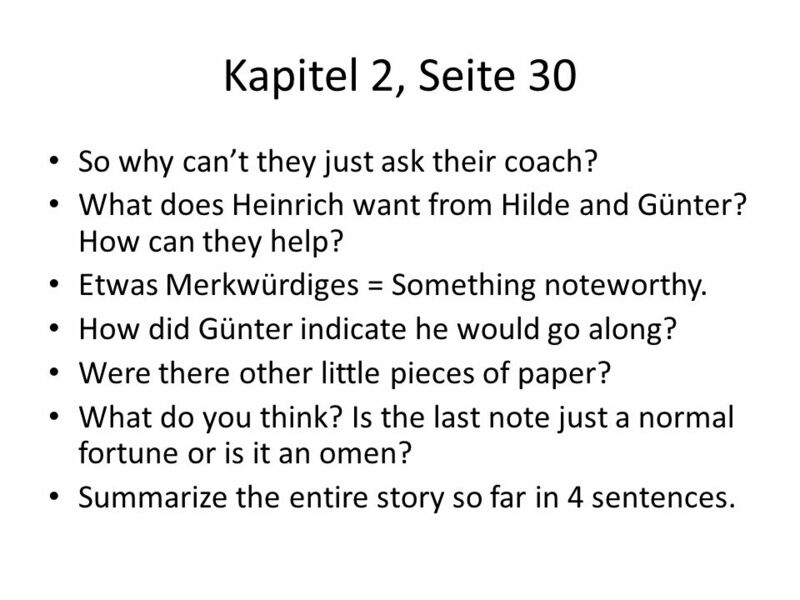 7 Kapitel 2, Seite 30 So why can’t they just ask their coach? What does Heinrich want from Hilde and Günter? How can they help? Etwas Merkwürdiges = Something noteworthy. How did Günter indicate he would go along? Were there other little pieces of paper? What do you think? Is the last note just a normal fortune or is it an omen? Summarize the entire story so far in 4 sentences. 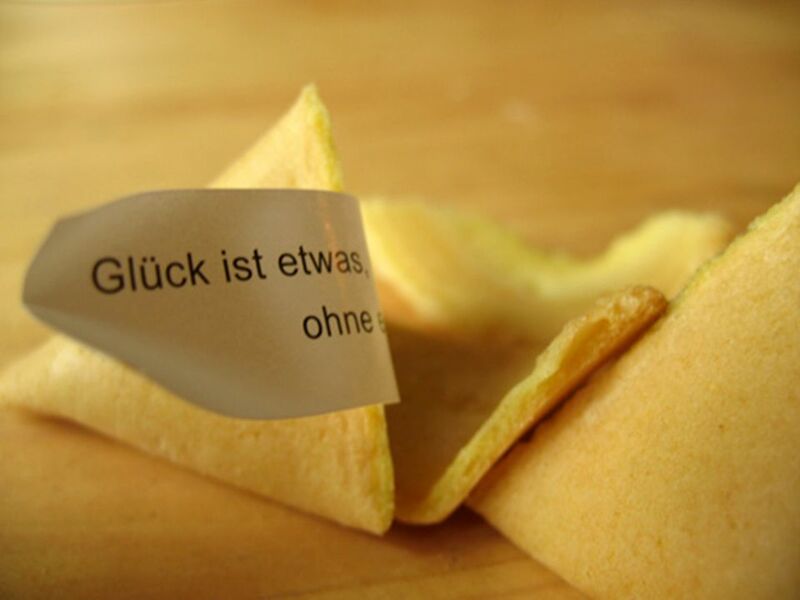 8 Kapitel 3, Seite 30-31 What’s different about the last fortune? (2 things) What does Mord mean? What is Günter’s reaction to the idea of this being an omen? 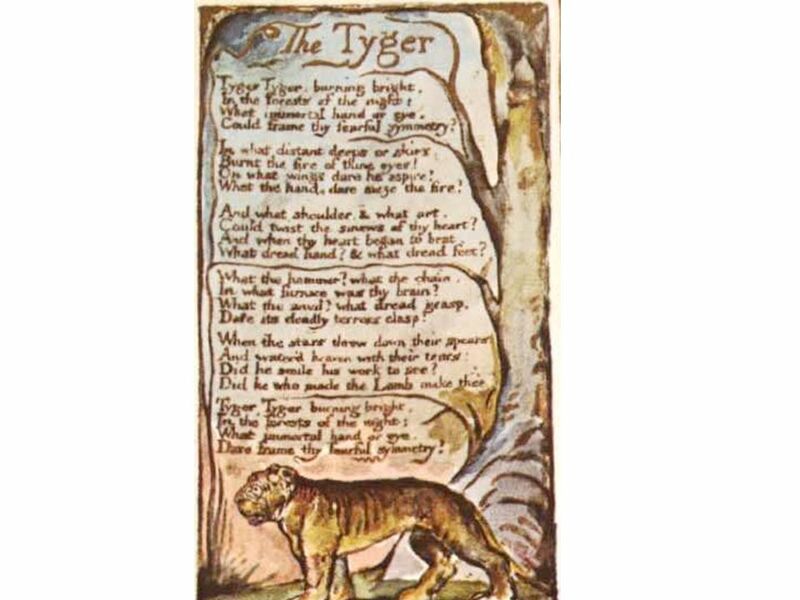 You probably don’t understand the joke about the William Blake restaurant. Don’t worry. Heinrich doesn’t get it either. 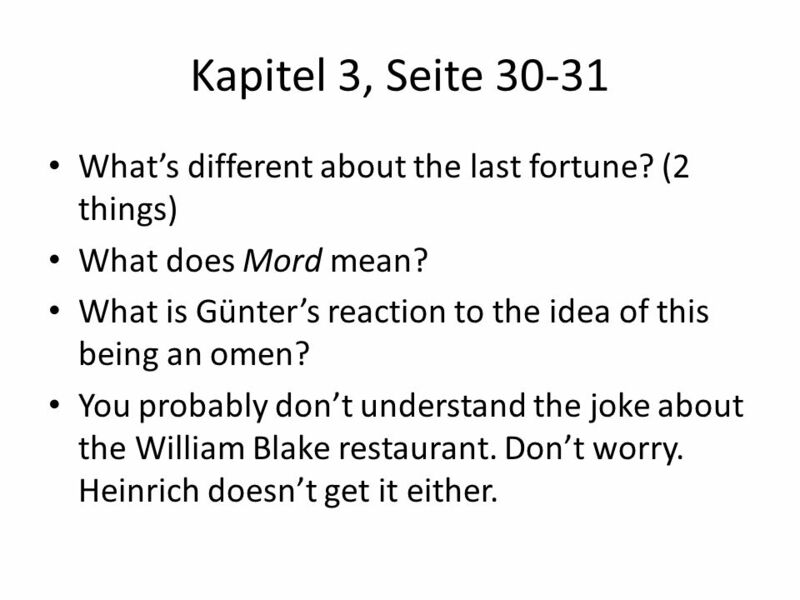 10 Kapitel 3, Seite 31 This part will be acted out. I need two students who can have a good argument. Take your booklets up and do the parts of Hilde and Günter. The argument is dumb, but what is the “background” of the argument? In other words, why an argument about cats and mice? 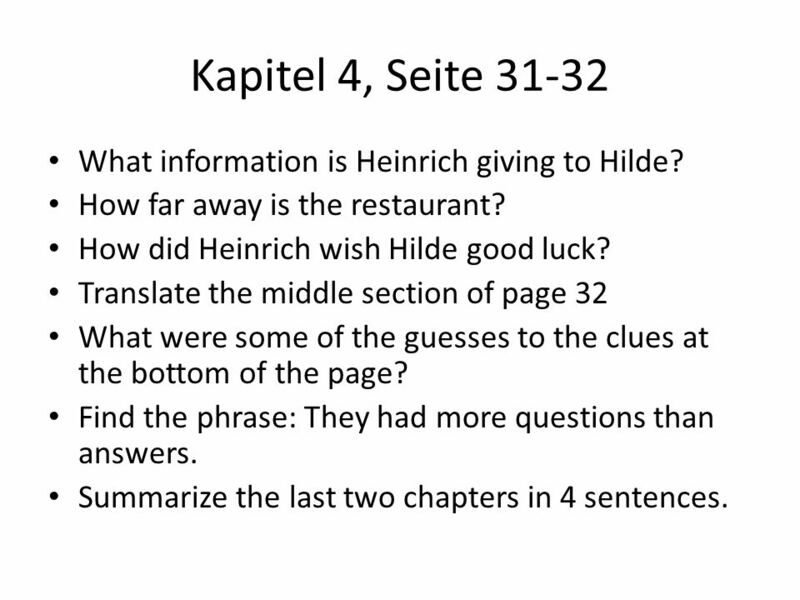 11 Kapitel 4, Seite 31-32 What information is Heinrich giving to Hilde? How far away is the restaurant? How did Heinrich wish Hilde good luck? 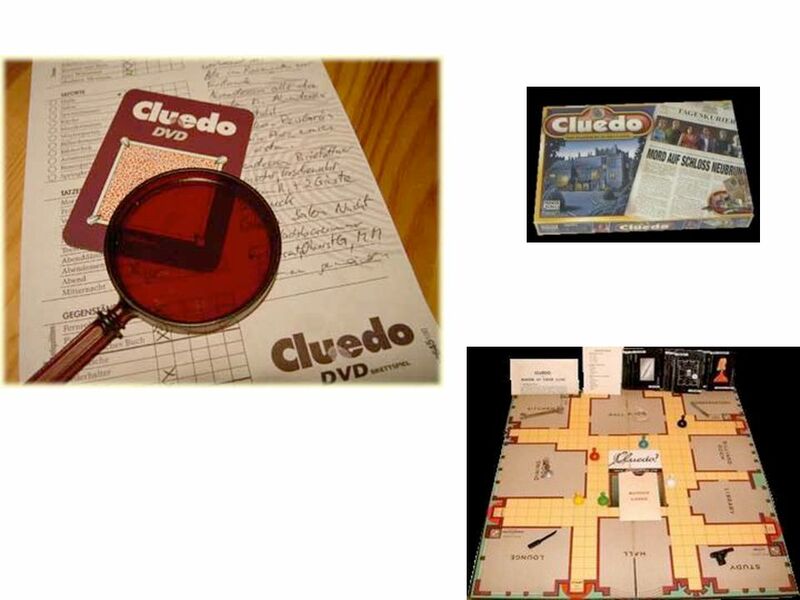 Translate the middle section of page 32 What were some of the guesses to the clues at the bottom of the page? Find the phrase: They had more questions than answers. Summarize the last two chapters in 4 sentences. 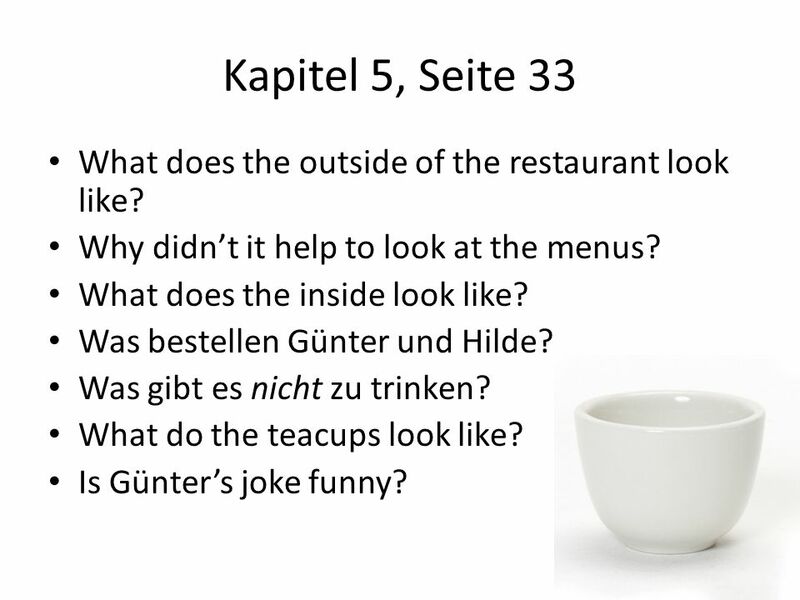 12 Kapitel 5, Seite 33 What does the outside of the restaurant look like? Why didn’t it help to look at the menus? What does the inside look like? Was bestellen Günter und Hilde? Was gibt es nicht zu trinken? What do the teacups look like? Is Günter’s joke funny? 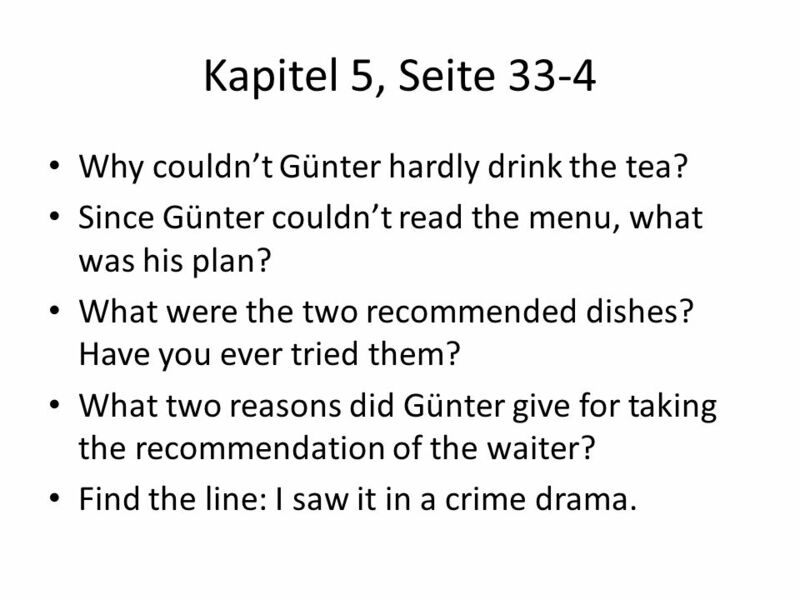 13 Kapitel 5, Seite 33-4 Why couldn’t Günter hardly drink the tea? Since Günter couldn’t read the menu, what was his plan? What were the two recommended dishes? Have you ever tried them? 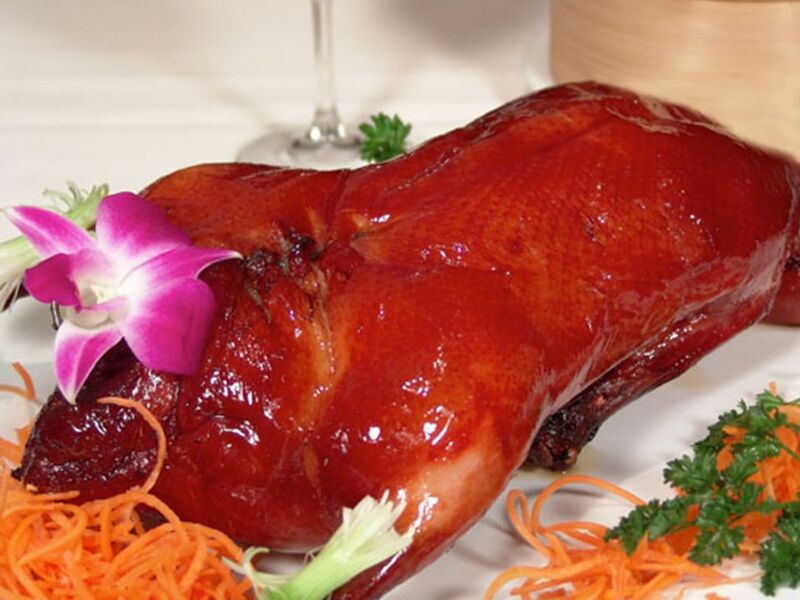 What two reasons did Günter give for taking the recommendation of the waiter? Find the line: I saw it in a crime drama. 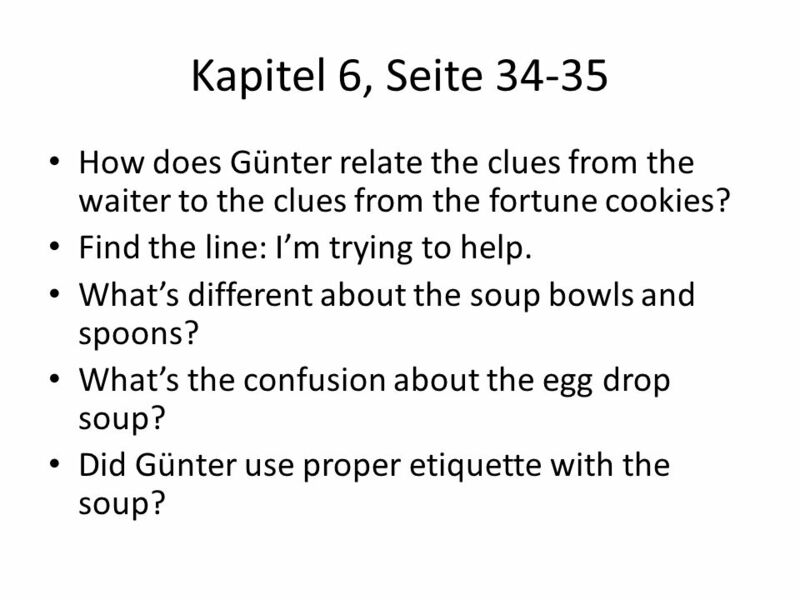 16 Kapitel 6, Seite 34-35 How does Günter relate the clues from the waiter to the clues from the fortune cookies? Find the line: I’m trying to help. What’s different about the soup bowls and spoons? 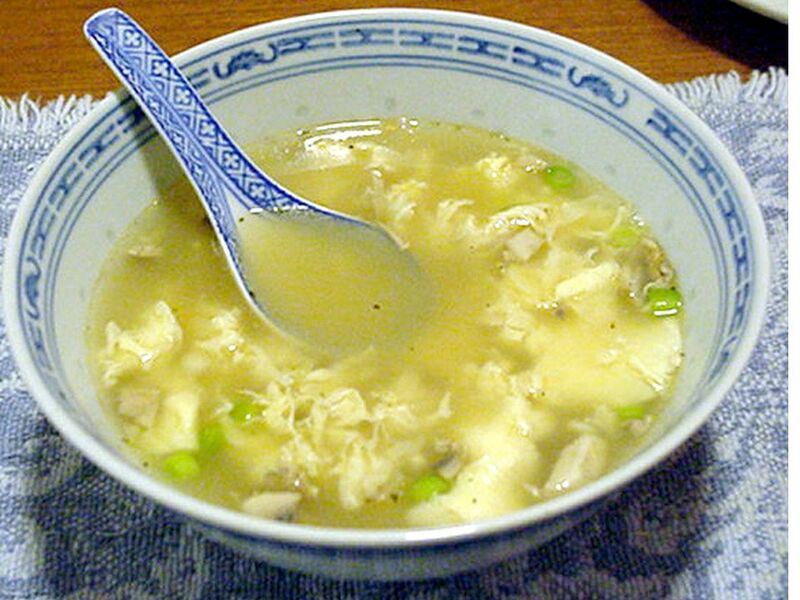 What’s the confusion about the egg drop soup? Did Günter use proper etiquette with the soup? 17 Kapitel 6, Seite 35 Find the word for “chopsticks”. Does Günter know how to eat with chopsticks? Does Hilde? Do you? Try to use two pencils as chopsticks and pick up another pencil. 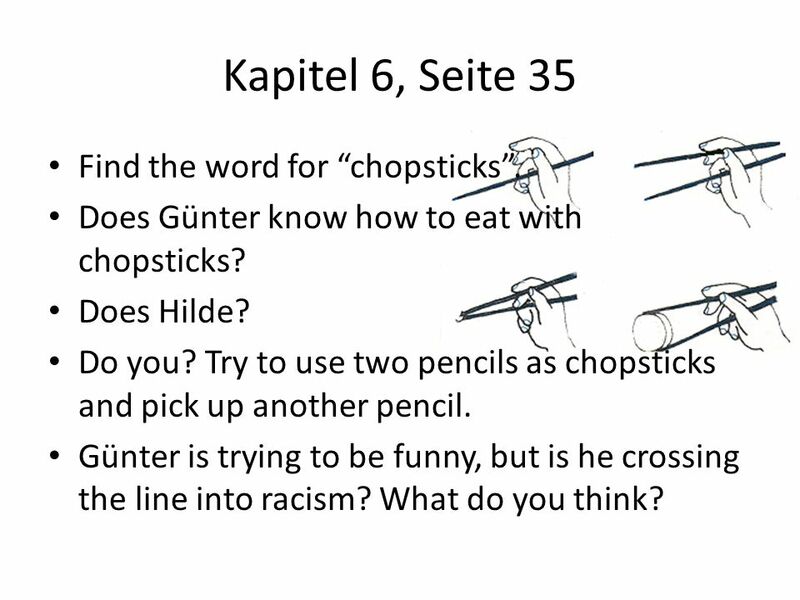 Günter is trying to be funny, but is he crossing the line into racism? What do you think? 18 Kapitel 7, Seite 36-7 Find the line that says: And besides, it’s impolite. Find the line that says: Try it! Look at me. Watch how I eat with them. What would “ich gebe auf” mean? 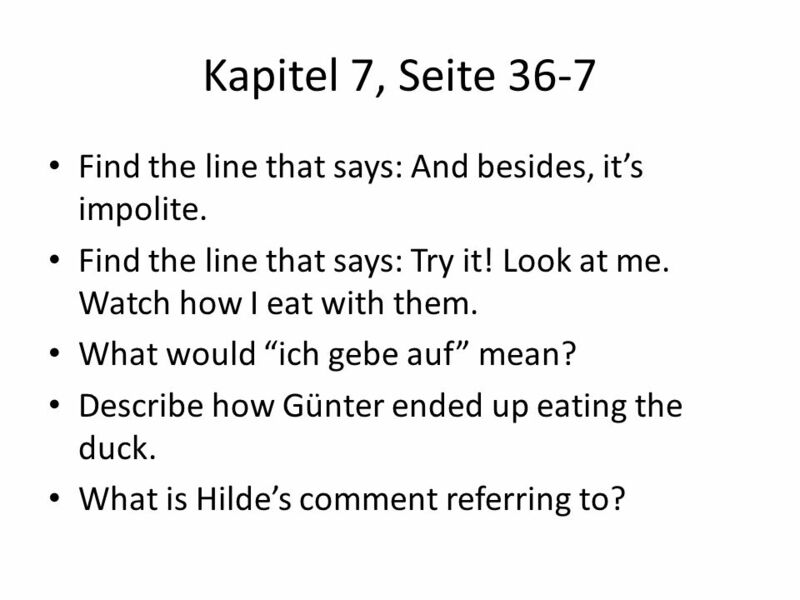 Describe how Günter ended up eating the duck. What is Hilde’s comment referring to? 19 Kapitel 7, Seite 37-8 Could you figure out a way to translate: Ich kann es kaum glauben, was du für eine Schweinerei hier im Restaurant angerichtet hast. 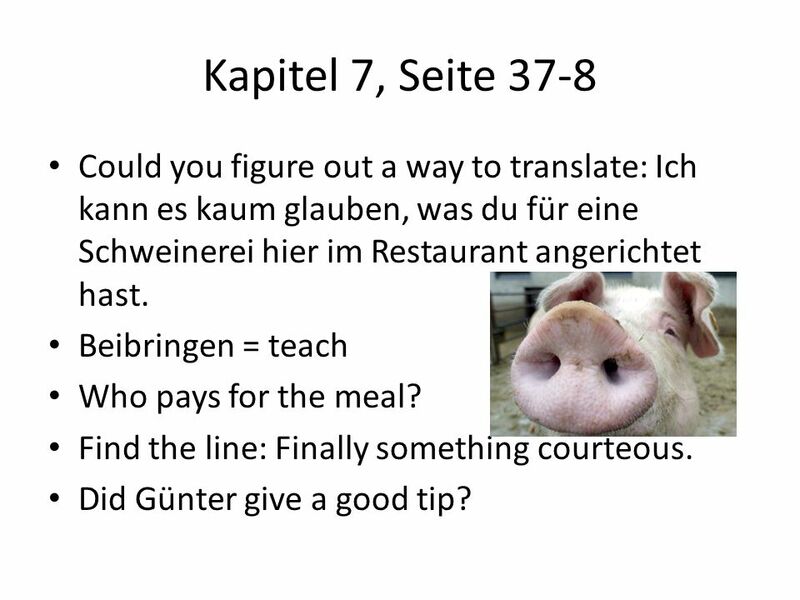 Beibringen = teach Who pays for the meal? Find the line: Finally something courteous. Did Günter give a good tip? 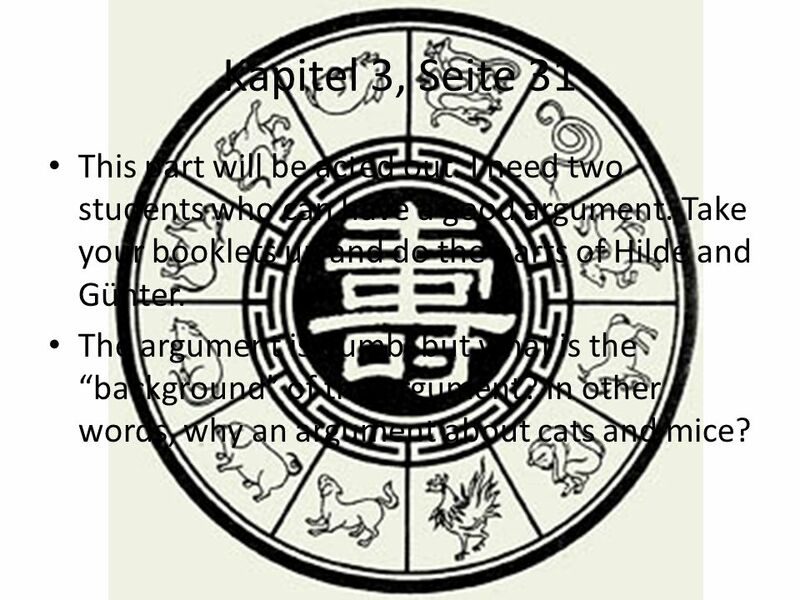 20 Kapitel 8, Seite 38-9 What did the first fortune say? What about the 2nd one? 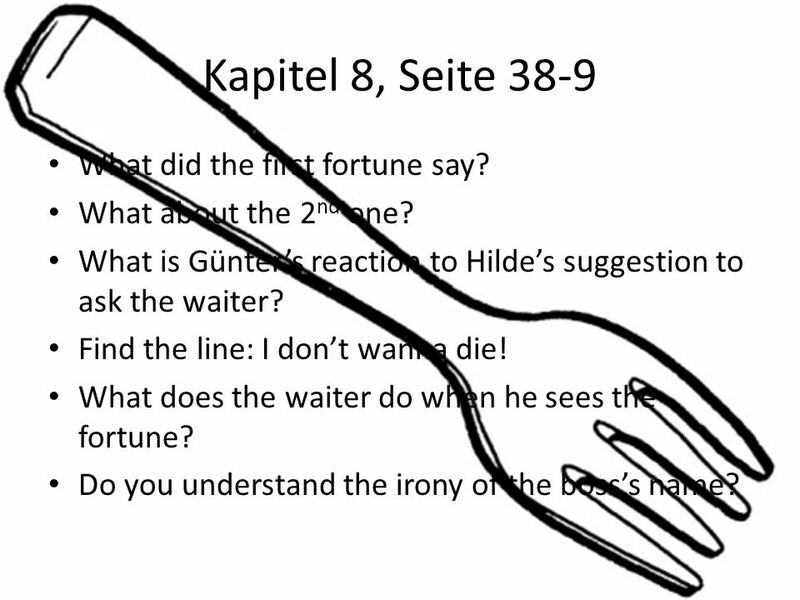 What is Günter’s reaction to Hilde’s suggestion to ask the waiter? Find the line: I don’t wanna die! What does the waiter do when he sees the fortune? Do you understand the irony of the boss’s name? So what is really going on here? Of course, you knew that all along, right? 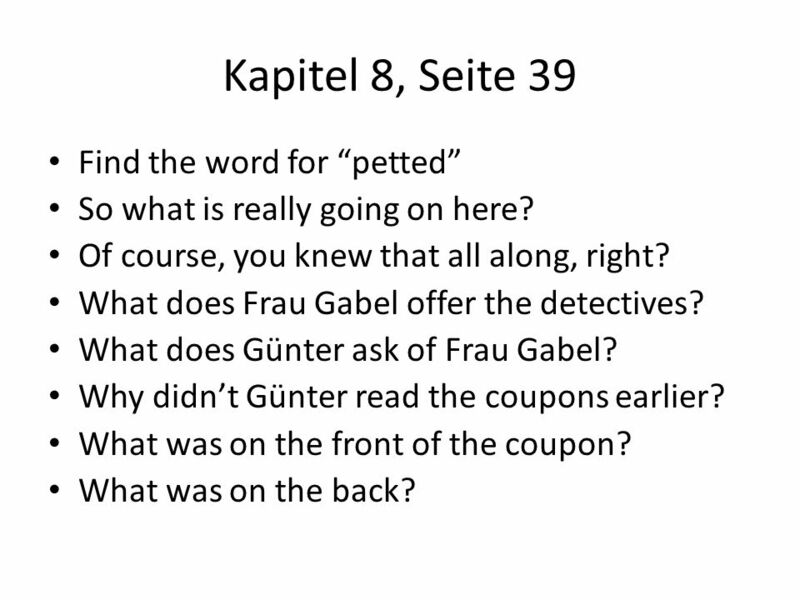 What does Frau Gabel offer the detectives? What does Günter ask of Frau Gabel? Why didn’t Günter read the coupons earlier? What was on the front of the coupon? What was on the back? © Mark E. Damon - All Rights Reserved Round 1Round 2 Final Jeopardy jan Gisela Elke. Spoken English Sybil Wang March. 23 rd, 2012 UNIT 5. Reading Grade 6 Part 2 SOL Released Test 27. The author uses the verb barked in paragraph 9 to show that Maria is A. A. also getting sick B. B. teasing. Chapter one Deutsch 1 By : Monica Encabo, Amber Griffith, and Marly Jordan Vocabulary Section Instructions.